An obelisk commemorates the 150th anniversary of the exploration and naming of the Hawkesbury River by Governor Phillip in 1789. On June 6 1789 Captain Arthur Phillip led an expedition to Broken Bay, sending supply boats up the coast. He and his party, including Hunter from Sirius, Collins, Johnston, White and marines trekked overland. They camped at Pittwater, proceeded to investigate Brisbane Waters and then found the main stream and proceeded as far as Dangar Island. 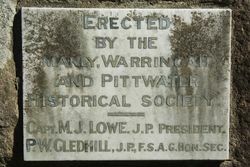 Phillip named the waterway the Hawkesbury after the President of the Council of Trade and Plantations in the Pitt Ministry. An obelisk to commemorate the 150th anniversary of the discovery and naming of the Hawkesbury River by Governor Phillip in 1789 is being erected at Brooklyn by the Manly-Warringah-Pittwater Historical Society. The memorial will be unveiled on Saturday afternoon, June 17, by the Commissioner for Railways, Mr. Hartigan. After the ceremony, visitors will be taken on an excursion along the river. The Sydney Morning Herald (NSW), 29 April 1939. Unveiled by T. J. Hartigan C.M.G. Capt. M.J. Lowe. J.P. President. P.W. Gledhill, J.P., F.S.A.G. Hon. Sec.